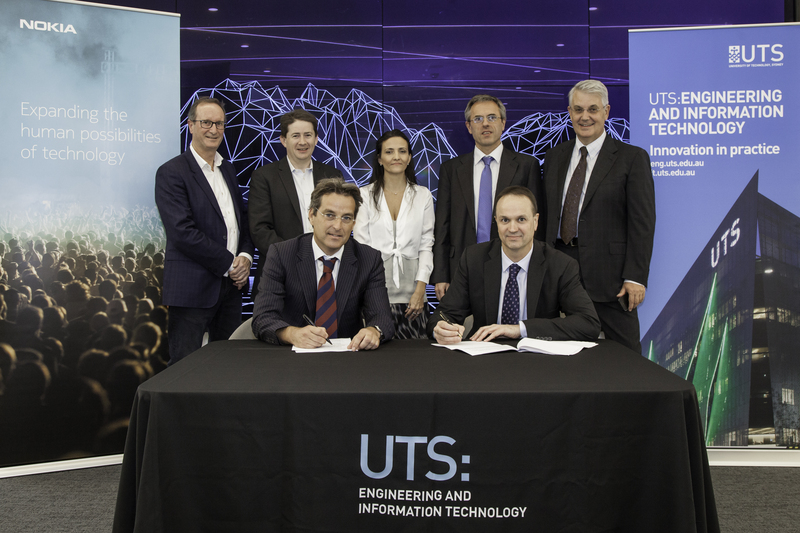 UTS has signed a five year agreement with Nokia, a global leader in innovation technologies connecting the world. The two organisations have signed a Memorandum of Understanding (MoU) to collaborate on developing IoT-based business applications using high-speed, ultra-low latency technologies such as 5G. A collaborative innovation and training facility will be created on campus at UTS, with Nokia providing IP routing, optical, fixed and 4G and 5G mobile network components, and applications and analytics platforms for project work and training. A formal launch event featured Marcus Weldon, President and Corporate Chief Technology Officer, Nokia Bell Labs. His talk, A digital fabric for the future (link to be provided), offered a reinterpretation of Maslow’s Hierarchy of Needs for a fully digital age, and his definition of a new era, the Automation of Everything, enabled by digital interfaces and data analysis of information delivered by artificial intelligence, IoT, virtual reality and automated systems. He looks to a shift in how networks are built for new digital experiences that save time, by “reducing time to save time’, decreasing distance and waste, through low latency. Nokia’s first public demonstration of 5G latency was hosted by the School of Computing and Communications in 2016, as UTS leads Australia’s 5G research effort to improve the connectivity of the devices we use daily. This event characterised a long Faculty association with Nokia, a key member of our graduate program and recent member of the Faculty Advisory Board. “Our relationship with Nokia is an example of how UTS aims to link with major industrial innovators and deliver outcomes that translate ideas into viable products and solutions, leveraging advanced technologies,” said Associate Professor Myriam Amielh, Associate. Dean External Engagement, FEIT. Myriam can explain the different ways for industry to engage with UTS, including through UTS: Rapido, a new technology development unit established to help businesses unlock the potential of IoT, leveraging the expertise of 200+ FEIT researchers across technology areas including data analytics, cyber security, 5G and IoT. “UTS: Rapido will contribute our expertise in 5G, IoT and data analytics to help Nokia's customers unlock the potential of emerging digital capabilities,” she said. The technology partnership will work on advanced engineering projects that support the development of future network services for technological challenges faced by service providers and enterprises. Nokia and UTS will also explore the expansion of this advanced engineering activity into new areas of innovation and proof-of-concept development. "The successful implementation of IoT and the connectivity of potentially billions of devices will rely on the deployment of technologies such as enhanced 4G and high-speed, low-latency 5G,” said Ray Owen, Head of Oceania at Nokia. You can read about Rapido projects already underway in the March issue of UTS U: Mag. © Copyright UTS - CRICOS Provider No: 00099F - 04 May 2018 07:45 AM. The page is authorised by Deputy Vice-Chancellor and Vice-President (Corporate Services).